The greatest pop night Birmingham has ever seen? Radio DJ and television presenter Sara Cox will 'step back in time' at Birmingham's O2 Institute on May 19, 2018. The 43-year-old BBC Radio 2 host is bringing her Just Can't Get Enough 80s show to the Digbeth venue, playing tunes from the likes of David Bowie, Belinda Carlisle, Wham! and Kylie Minogue. Also on the turntable will be Erasure, Tiffany, T'Pau and Whitney Houston. 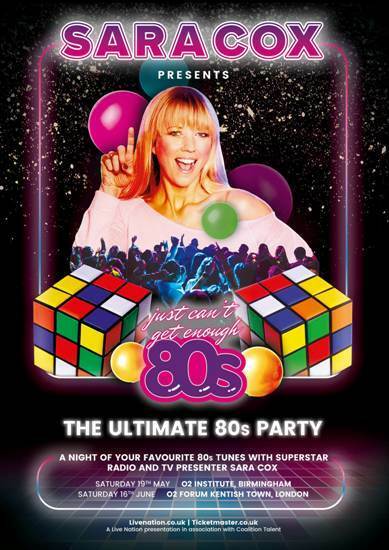 It promises to be dream night for fans of 80s music. Sara knows all about the music of the 80s – she began presenting Sounds of the 80s on Radio 2 in 2013. She hosted her final edition on May 11, 2018, handing over the reins to veteran DJ Gary Davies, allowing her to move to a new Radio 2 slot, Monday to Thursday between 10 pm and midnight. On television, she has just launched a new BBC programme, Love in the Countryside, and this year has been co-presenting Back in Time For…, where a modern-day family enjoy meals that were experienced by families of years gone by. In 2017 she completed a 24-hour solo danceathon, raising more than £800,000 for Comic Relief's Red Nose Day. During June and July, Sara will take her Just Can't Get Enough 80s show to festivals in Bristol, Leeds, Exeter and Southampton, as well as Camp Bestival on July 27. On June 16, she hosts at O2 Forum, Kentish Town, London.